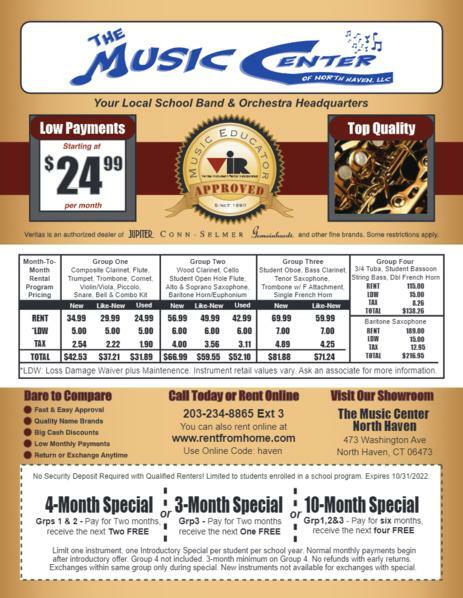 The Music Center of North Haven LLC Rental Dept. We Rent Pro Keyboards, Portable Digital Pianos, Small and Large Pa Systems, Amplifiers, 5 Pc Drum Kits, Cordless Microphone Systems, Professional Karaoke Machines Setups (comes with music) and More for that Special Event by the Day. Average Rentals Start at $35.00 per Day per Item and Up (Depends on what is Being Rented) Must Be 21 or Over, Have a Major Credit Card and Valid Drivers License to Rent. Rental Fee is due Up Front. Deposits are Held Until Gear is Returned and Checked Out. Must Return During Regular Store Hours. 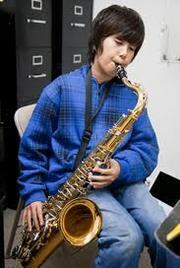 Our School Band Rental Program Is One of the Best in the State! 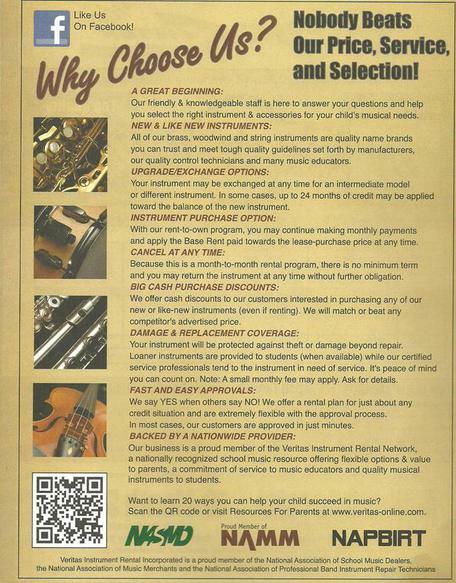 We Only Rent Name Brand Instruments With Part of Your Rental Payment Applied Toward the Purchase Of the Instrument If You Choose. 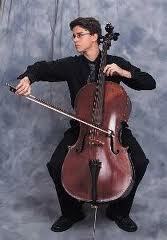 We Also Rent on a Per Day Basis as Well. Special Low Rates for Our 4 and 10 Month Programs to Suit Everyones Needs. Repair Loaners for a fee, when Available. If you would like More Info, Please Contact Us or Use Our Request Information Form Link to the Right of this Page. 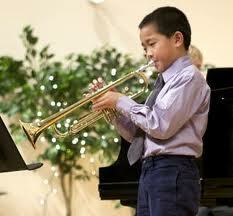 A In-expensive Short Term Program to See if You or Your Child is Interested in Playing a Instrument. Instruments Available for Rent are Alto Sax, Bari Horn, Bass, Cello, Clarinet, Flute, French Horn, Guitar, Tenor Sax, Trumpet, Trombone, Violin, and Viola to Name a Few. 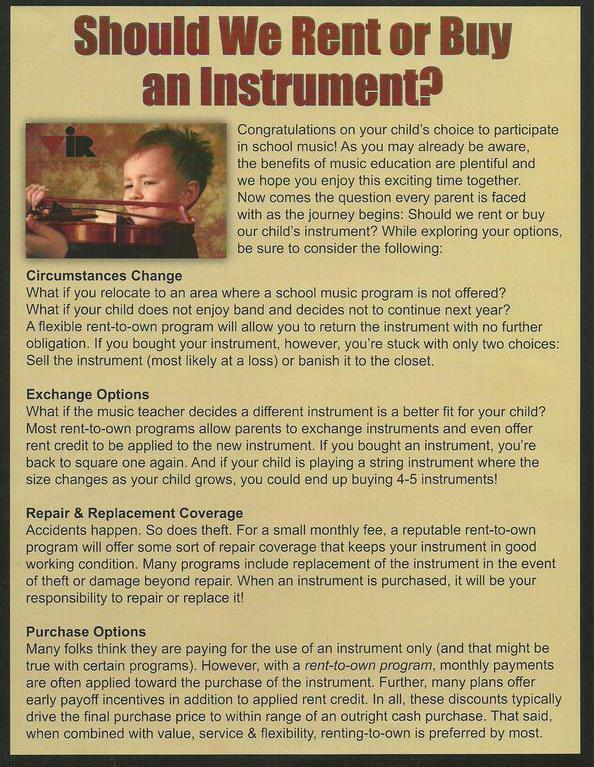 With This Program, A Portion of your Rental Payment Will Go to the Eventual Purchase of the Instrument if You Choose to But There is Nothing In the Contract that Says You Have To. Contact Us for More Info. Same As Above Except The Term is for 10 Months and the Rate is More Economical! All Repairs Are Done By Us. Repair Loaners Are Available on a First Come, First Serve Basis. Feel Free to Contact Us with your Questions or Concerns! Scroll Down for Rate Sheet. 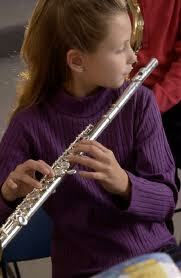 New Group 3 School Band Rental - 3 Month Special!